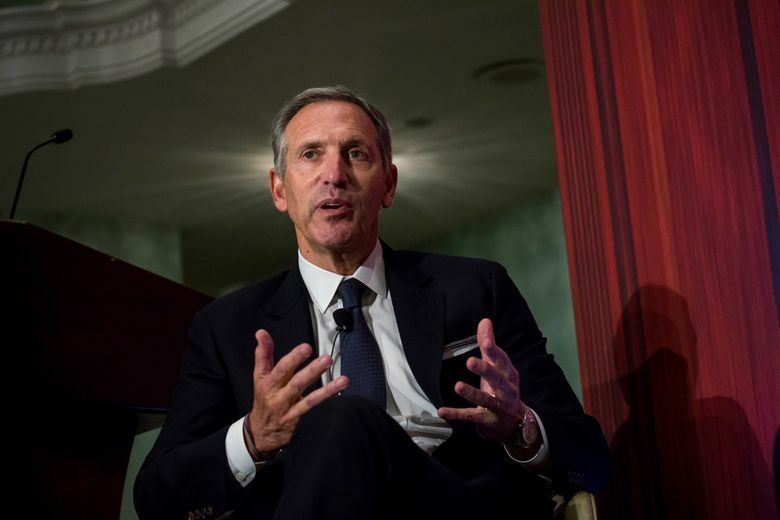 Howard Schultz, former CEO of Starbucks, cast himself as a compassionate leader who wanted to use the company for social good. (Bloomberg photo by Michael Nagle, 2017). Howard Schultz, who has a net worth of about $3.3 billion and describes himself as a "lifelong Democrat," has not said publicly whether he will mount a presidential campaign and has kept open the option of running as a Democrat. Trump’s opponents, including many Democratic strategists, have expressed concerns that a serious three-way race in November would divide the Democratic vote in a way that helps Trump win re-election, either directly by denying Democrats states they would otherwise have won or by shifting the ultimate decision to the U.S. House. “Anyone thinking of running for president as an independent would have to think really hard about splitting the anti-incumbent, anti-Trump vote, and just playing the spoiler role and re-electing Trump,” said Howard Wolfson, a former strategist for Hillary Clinton’s 2008 presidential campaign. He now advises former New York Mayor Michael Bloomberg, who is considering his own presidential campaign, as a Democrat. In all but two U.S. elections, candidates have won the presidency by earning a majority of electoral-college votes. He has spoken in his deliberations with a network of former Starbucks advisers and board members, including former New Jersey senator Bill Bradley, D, and Steve Schmidt, the former campaign manager for John McCain’s 2008 presidential run. But he also has signaled a willingness to break with Democratic orthodoxy. “We have to go after entitlements,” he said in the CNBC interview after announcing his retirement last year. He also dismissed as “false promises” the proposals for single-payer health care and guaranteed federal jobs that have become popular on the left, arguing that they were fiscally unworkable. At his March 2016 Starbucks shareholder meeting, Schultz opened his speech with a video montage highlighting the political divisions in the country, including still photographs of angry protests as well as the Democratic and Republican primary debates featuring Clinton and Trump. The video ended with footage of Attorney General Robert F. Kennedy in 1968 calling for national unity and love in the wake of Martin Luther King Jr.’s assassination.